Visible-light astronomy encompasses a wide variety of observations via telescopes that are sensitive in the range of visible light (optical telescopes). It includes imaging, where a picture of some sort is made of the object; photometry, where the amount of light coming from an object is measured, spectroscopy, where the distribution of that light with respect to its wavelength is measured, and polarimetry where the polarisation state of that light is measured. An example of spectroscopy is the study of spectral lines to understand of what kind of matter light is going through. Visible astronomy also includes looking up at night (skygazing). Visible-light astronomy is part of optical astronomy. Based only on uncertain descriptions of the first practical telescope, invented by Hans Lippershey in the Netherlands in 1608, Galileo, in the following year, made a telescope with about 3x magnification. He later made improved versions with up to about 30x magnification. With a Galilean telescope the observer could see magnified, upright images on the earth—it was what is commonly known as a terrestrial telescope or a spyglass. He could also use it to observe the sky; for a time he was one of those who could construct telescopes good enough for that purpose. On 25 August 1609, he demonstrated one of his early telescopes, with a magnification of about 8 or 9, to Venetian lawmakers. 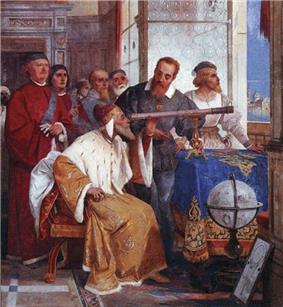 His telescopes were also a profitable sideline for Galileo selling them to merchants who found them useful both at sea and as items of trade. He published his initial telescopic astronomical observations in March 1610 in a brief treatise entitled Sidereus Nuncius (Starry Messenger). The visibility of celestial objects in the night sky is affected by light pollution. The presence of the Moon in the night sky has historically hindered astronomical observation by increasing the amount of ambient lighting. With the advent of artificial light sources, however, light pollution has been a growing problem for viewing the night sky. Special filters and modifications to light fixtures can help to alleviate this problem, but for the best views, both professional and amateur optical astronomers seek viewing sites located far from major urban areas.